The denim is pretty stretchy but size up if you can. It’s not the thickest jacket, but it’s perfect for layering and the denim is durable for bails I’m skating. The two inside pockets and zipper sleeves are nice touch too. Everything about Brooklyn cloth is great. They have fast shipping times, they’re honest and good salesmen, and their clothing is great. The only gripe I’ve ever had with my purchase of my black skull jacket was that one of the buttons on the cuff was broken and beyond repair at this point. Other than that, I have a great jacket and Brooklyn cloth to thank for it! This is my favorite denim jacket, maybe even my favorite jacket that I own. It’s incredibly soft and it’s also pretty stretchy at the right places. The embroidery is awesome and also looks like high quality stitching. For <$100 this jacket is a steal, especially when considering some denim jackets at high end retailers with similar embroidery goes for 3 to 5 times the price. I’m 5’10” 165lbs, ordered a large and it fits perfectly. Shipping was faster than I expected. Highly recommend. Would buy future products from here if they’re equally as badass lol. great jacket. I love it. This jacket looks badass and feels very comfortable. My only complaint is that it’s not a very thick denim, more of a thin stretch denim. Make sure you order a size larger because the arms are fairly slim. I usually wear medium and I ordered large, I’m hoping the sleeves will stretch out a bit with wear. I can comfortably fit a hoodie underneath for cold weather but may have to throw a flannel or thermal in as well since the material is thinner. 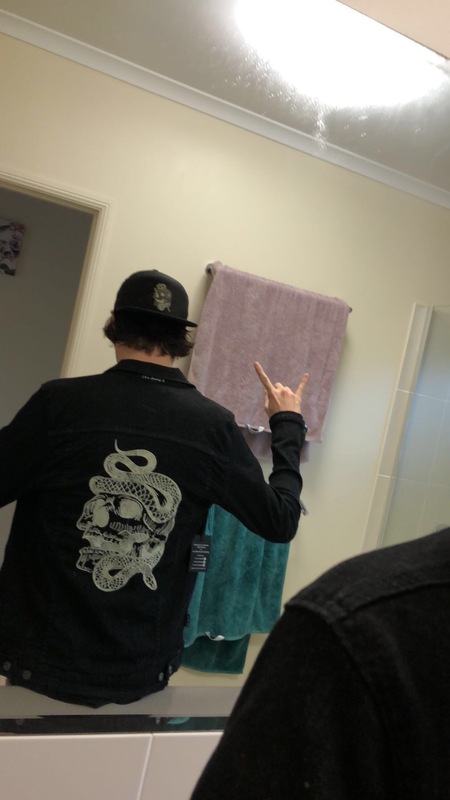 Embroidery is awesome, jacket feels good quality. Just wish it was the thicker, warmer denim!